The paper’s decision to endorse Gardner in 2014 was already notorious, especially among Colorado Democrats; it was a major coup for the upstart Republican congressman, lending him an aura of moderate credibility in an increasingly Democratic-leaning state. While it’s impossible to know for sure whether the Post’s support made a difference, political science research suggests that major newspaper endorsements can swing election results by between 2 and 5 percentage points. Gardner’s eventual margin over Udall was just 1.9 percent. On a range of issues from the Affordable Care Act to foreign policy, the reality of Gardner’s term in the U.S. Senate has made a mockery of what Colorado voters on both sides of the aisle were promised. Considered in aggregate, the Post had an obligation to put distance between their prediction of Gardner’s service in the U.S. Senate and the reality in hindsight for the sake of their own credibility–and if it hadn’t been the national emergency it would have been something else, and soon. It was already looking like a tall order to replicate 2014’s narrow victory in a state that has only moved further away from Gardner’s party and politics. 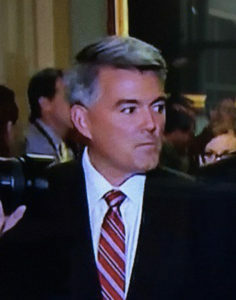 However belated or imperfect this recognition may be of what Cory Gardner really is and has done since winning in 2014, we are witnessing a turning point from which Gardner may have no way to politically recover. Will be interesting to see if the Post endorses him in 2020. I guess it depends on who the Dems. nominate. That would be quite a backtrack …. to endorse him in 2020, after they (far too belatedly) have eaten crow on their 2014 pick. And I do think they were the factor that got him elected.
. . . wanna’ bet? I got $100 to your fav charity that's almost exactly how it will come down. Agree with most of the article. But don't forget the ineptitude of the Udall campaign, with its near total focus on abortion. All the good stuff Udall had done for the Colorado environment and public lands was ignored by his campaign staff until near the bitter end. Mark had one of the best rural stories never told. You are correct. Udall focused on abortion to the expense of everything else, both about what was good about him and his record, and what was wrong with Gardner. But, I remember papers like the Aurora Sentinel and the Durango Herald making the case against Gardner that "you just can't trust him". Udall should have talked up his own record while making the case that "you can't trust Gardner". As far as the Post endorsement of Gardner goes, they dinged Udall for running a single-issue campaign. That was the only part of their endorsement that was correct. Udall was the canary in the coalmine for Gardner's abortion deceits. Think Brett Cavanaugh. I guess nobody believed that Gardner would stomp on women's choices when he got the chance. In hindsight Udall was right to warn voters about Gardner's deceptive denials regarding eliminating safe abortions. True. But he focused on that at the expense of everything else. I always said, and still maintain, that Garner didn't win that election; Udall lost it. The people who ran that campaign ought to have had "Loser idiot” stamped on their foreheads and been driven out of politics forever. Yep, remember it well. Republicans, and more than a few Dems as well, took to calling him "Mark Uterus." Attorney John Walsh is yet another Democrat "exploring" a run for Gardner's Senate seat. Like Lorena Garcia and Trish Zornio, he has no previous governing experience. But he is a photogenic white male, so his chances will automatically be presumed to be greater than those of the two women.